American youth (ages 12–17) are suffering from health problems not previously seen among this age group. From gross obesity, to diabetes, to heart problems, large numbers of our youth are unhealthy. On this Sunday, we want to promote healthy lifestyles, encouraging our young people to make wise choices regarding the food they eat, daily exercise, and actions that lead to healthy living. To reinforce the theme for this Sunday, plan a range of health-related activities for Youth Sunday weekend. Consider sponsoring a health walk through the city or a neighborhood or host an intramural game tournament. Both ideas help drive home the importance of health while facilitating fellowship and fun. The Word of God teaches us that all we do should be done for the glory of God. Today, we celebrate our young people, encouraging them to let the light of God shine through their lives. We pray for their wholesome development in mind, body, and spirit. We encourage them to develop healthy lifestyles and to make healthy choices so that the divine will of God will be fully actualized in their lives. Today, let’s give God praise for our youth! Youth Reader: We, as young people, are not just the future—we also have the potential to make a world of impact TODAY! People: Christians are temples of the Holy Spirit, selected for divine use, designated for holy purposes. Youth Reader: Each day must be spent feeding our mind and our body healthy ingredients. We must educate ourselves spiritually and academically. We provide for our bodies nutrients to fuel our dreams and goals. People: We are in the world, but not of the world. Youth Reader: We choose to lift a higher standard. Our social and nutritional diets reflect the best of what God has to offer for energy, sustenance, and motivation! People: God will take care of all that concerns us, and expects us to do all we can to be fit for God’s purposes. Youth Reader: Exercise, discipline, and tenacity are all a part of the formula for success in every aspect of life. All Adults: We acknowledge the pursuit of wholesome lifestyles as a sacred charge and commit ourselves to being examples of healthy lifestyles so that our youth will choose healthy lifestyles. Strengthen us, Lord, to do better than we have done. Dear Lord, you are our Creator. You have made each of us responsible for maintaining your creation. In our hearts, we place you first among our priorities. In our bodies, we strive for optimal health. Renew in all of us the desire to attain health and wholeness. 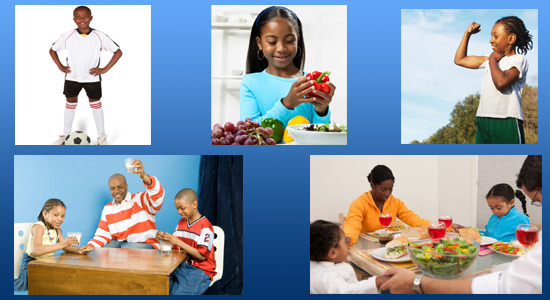 Help our parents and adults to place the health of our young as a priority. Help our youth to make sound lifestyle choices and to honor their bodies as temples for your Holy Spirit. In your blessed name we do pray. Amen. Walker, Hezekiah & The Love Fellowship Crusade Choir. Family Affair. New York, NY: Verity, 2000. Taylor, Kathy. Live: The Worship Experience. Indianapolis, IN: Tyscot, 2009. Trotter, Larry & The Sweet Holy Spirit Combined Choir. What’s 2 Come Is Better Than What’s Been. Indianapolis, IN: Tyscot, 1999. McAllister, Judith Christie. Essence of Praise & Worship Live. Nashville, TN: Alliant, 2005. Armstrong, Vanessa Bell. Desire of My Heart: Live in Detroit. New York, NY: Verity, 1997/1998. Mayes, Gary & Nu Era. The N.E. X-perience, Vol.1. Houston, TX: GVM, 2002. Tribbett, Tye & G.A. Victory Live. New York, NY: Sony, 2005/2006. Whitman, Walt & The Soul Children of Chicago. Growing Up. Nashville, TN: Light, 1996. Whitman, Walt & The Soul Children of Chicago. This Is the Day. Los Angeles, CA: I Am Records, 1990. Youthful Praise. Exalted… Live in Baltimore. Nashville, TN: Light Records/Evidence Gospel, 2007. Clayborn, Jason & Thee Ensemble. MusicWord Tieology. Louisville, KY: Complete Tribe Entertainment, 2007. Lawrence, Donald & Company. I Speak Life. New York, NY: Verity, 2004. West Angeles COGIC Mass Choir. No Limit. Nashville, TN: EMI Gospel, 2007. Love Alive IV. Jackson, MS: Malaco, 1990. Finale: Act II (Live). Nashville, TN: EMI Gospel, 2006. Walker, Hezekiah & The Love Fellowship Crusade Choir. 20/85 The Experience. New York, NY: Verity, 2005. Vega, Tata. Now I See. New York, NY: Warner Bros., 1998. Mary, Mary. The Sound. New York, NY: Columbia, 2008. Life. New York, NY: Sony, 2004. Aikin, Crystal. Crystal Aikin. New York, NY. Verity/Zomba/BET, 2008. New Jersey Mass Choir. Hold Up the Light. Nashville, TN: Light, 1987. Pace, Joe & The Colorado Mass Choir. Best of Joe Pace & The Colorado Mass Choir. New York, NY: Verity, 2001. Pace, Joe & The Colorado Mass Choir. God’s Got It. New York, NY: Verity, 1999. McClurkin, Donnie. Live in London and More…. New York, NY: Verity, 2000. Jakes, T.D. Get Ready: The Best of T.D. Jakes. New York, NY: Sony, 2000. Walker, Hezekiah & The Love Fellowship Crusade Choir. Family Affair, Vol. 2: Live at Radio City Music Hall. New York, NY: Verity, 2002. Lawrence, Donald & the Tri-City Singers. Finale Act I. Nashville, TN: EMI Gospel, 2006.